Operating Era: 1923-1973. THIS SERIES NOW COMES WITH OUR ONE-PIECE ROOF FRAME. Atchison, Topeka & Santa Fe. 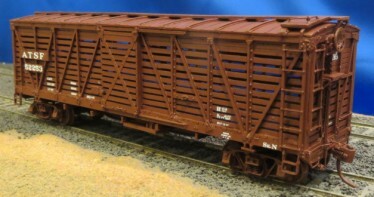 A double sheathed box car with partly visible steel frame, the Bx-3 is unique in car building. Santa Fe received 4,000 cars from AC&F, Pullman and Standard Steel in 1924 and another 1,000 visually identical Bx-6 cars from Pullman in 1925. All were delivered with plate steel doors which were soon strengthened with braces. By the 1930`s corrugated doors were replacing the plate doors but the latter could be seen for many years. In the 1940`s AB brakes were applied. Cars ran into the 1960`s. Some cars were rebuilt to carry stock and some were insulated for ice and salt. See our kit series 3700 for reefer versions. Operating Era: 1923-1973.